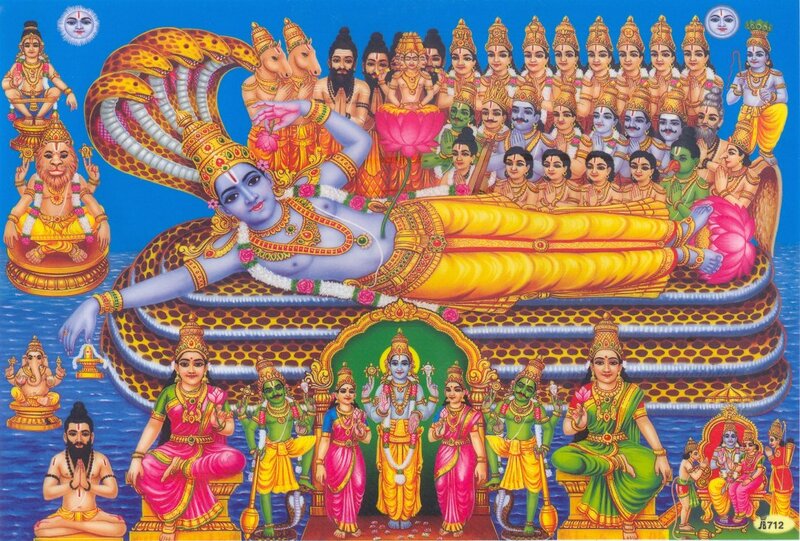 In this Part we will explore the meaning of the fourth Shloka of Sri Vishnu Sahasranamam. He is the Ultimate cause for the Universe, its sustenance, destruction and He manifests again and again for re-establishing Dharma. He is pure, untainted one who is forever compassionate to his devotees, He who supports the Universe and is most powerful, who can do whatever He wills without the help of anything or anyone. Sarvah means all or every. He is omnipresent and is the cause for everything. Just like a string that holds together the gems and pearls in a necklace, Vishnu holds all the Jivatmas much like the string in a necklace. Interestingly, the strings theory in quantum physics attempts to provide a complete, unified, and consistent description of the fundamental structure of our Universe. According to string theory, the entire world is made of strings. 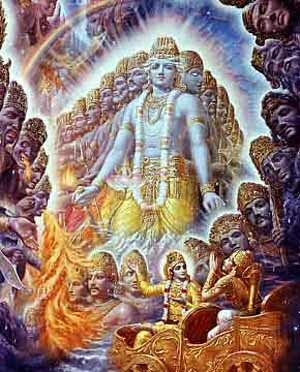 In the MahaBharata we have “Asatascha sataschaiva sarvasya prabhavaapyayaat Sarvasya sarvadaa jnaanaat sarvamenam prachakshate – He is the origin and end of everything whether real or unreal. He knows all things at all times. Hence He is known as Sarvah”. Meaning: I am the source of all Creations and everything emanates from me. The wise who know this perfectly, engage in My devotional service and worship Me with all their hearts. One who destroys all beings, at the appropriate time. Sri Adi Sankara says “Shrunaati samhaaarasamaye samharati samhaarayati sakalaah prajaah iti – When the time for destruction comes He withdraws all beings unto Himself”. Meaning: All beings, Arjuna, go to my prakrti at the Final Dissolution of the cycle of creation. Again, at the beginning of the (next) cycle, I create them. 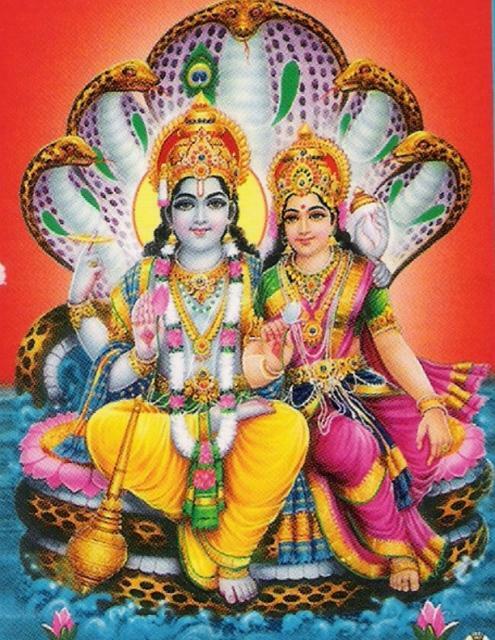 Sri Parasara Bhattar’s commentary says that the Lord is called sharvah because He removes the evils generated by the body (sva shareera bhootaanaam ashubhamapi shrinaati iti sharvah). This means that Bhagavan is called Sharvah because He destroys all the sins of His devotees. This name can be interpreted in 2 ways. He is the One who bestows auspiciousness to all. In the MahaBharata we have a verse that says “One who bestows all that is desired by His devotees is called Shivah”. “Shaasvatam Shivam Achyutam” – The Eternal, The Auspicious, and the One Who never lets His devotees fall. “Sa brahma sa shivah sendrah so’ksharah paramah svaraat” – He is Brahma, He is Shiva, He is Indra, He is Eternal, He is Supreme, He is the Lord of all. This means One who is firm and unwavering. The name derives from the root word stha-tishthati, indicating firmness or steadiness. Interestingly this is another name generally ascribed to Lord Shiva. It also means that Lord bestows unlimited benefits on his devotees. The story of Lord visiting the three Azhwars at Thirukovilur is an interesting one that illustrates his compassion and his desire to mingle with his devotees. 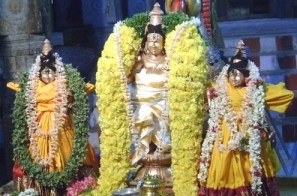 The first three of the Azhwars – Poigai Azhwar, Bhoothath azhwar and Pey Azhwar (referred to as Mudhal Azhwars) – came to Thirukovilur on a rainy night. Poigai Azhwar of Kanchipuram, who reached first, sought refuge at the ashram of Mrugandu Rishi who agreed to allow him in on the condition that there was place for just one person to sleep and that he was welcome to sleep there for the night. Bhoothathazhwar, from Thiru Kadal Malai (Mahabalipuram), followed shortly. He was welcomed with the message that there was place for one to sleep and two to sit and brought him inside. Pey Azhwar, from Thiru Mayilai (Mylapore), who was the last to reach the ashram, was told that there was place for one to sleep, two to sit and three to stand. So, the three of them stood there through the night sharing their experiences. A little later, the Mudhal Azhwars felt the presence of a fourth person and with space only for three to stand, they felt uncomfortable. Through their special vision, they realised that it was Ulagalantha Perumal of Thirukovilur who shared the space with them. Sri Peyazhwar, was able to see clearly the fourth person due to the lightning as well as the lamps lighted by the other two Azhwars. The fourth person was squeezing them tight. First and foremost, Azhwar’s eyes alighted on the glorious form of Sri Mahalakshmi adorning the broad chest of the intruder-“Thiru Kanden” is how an excited Peyazhwar sang out describing his moment of happiness, exulting in the wonderful spectacle that greeted his eye. Having realized, from the presence of the Divine Consort, that it was none other than the Paramatma Sriman Narayana who had entered the passage and was squeezing the trio, Azhwar’s sight fell next on the glorious golden Thirumeni of the Paramapurusha -“Ponmeni Kanden”. The brilliant and blazing complexion of the stranger imprinted itself upon Azhwar’s eyes, prompting him to comment ecstatically on the same-“Tigazhum arukkan ani niramum kanden”. The Lord’s Divine Discus and the Cosmic Conch adorning His upper hands presented a spectacular sight to the thirsty eyes of Azhwar-“Serukkilarum Ponnaazhi kanden, puri Shankham kai kanden”, after the Darshan of Ulagalandha Perumal, on one dark stormy night in Aippasi (Tamil month) at Mrugandu Rishi’s Ashram in Thirukovilur. Delighted at seeing the Lord, Poigai Azhwar sang 100 verses (Mudhal Thiruvandhadhi) beginning with ‘Vaiyam Thagazhiyay Vaarkadaley’ referring to the Universe as the lamp and the ocean as the oil. Bhoothathazhwar followed it with 100 verses beginning with ‘Anbey Thagaliye’ (Second Thiruvandhadhi) while Pey Azhwar showered another 100 verses (Third Thiruvandhadhi) of praise. It was here at Thirukovilur that the very first verses of the Nalayira Divya Prabhandham were composed and hence this place is credited as being the temple of the origin of the sacred 4,000 verses. This is taken as a single name. Nidhi means a treasure and avyayah means imperishable or everlasting. He is a permanent and inexhaustible treasure for his devotees. Physical treasures are limited and will get exhausted in course of time. Bhagavan is an everlasting treasure. He is one who manifests Himself at any place and at any time and in any form. Meaning: For the protection of the virtuous, for the destruction of evil-doers and to re-establish Dharma, I take birth millennium after millennium. All his Avatars are evidence of his regular manifestation to restore Dharma and destruction of evil. He is the One who gives the fruits of actions to all beings. Adi Sankara explains this as “Sarveshaam bhoktruunaam phalaani bhaavayatiti Bhaavanah – He bestows the fruits of actions for all the doers”. Basically it means the one Who is the sustainer of the Universe. Adi Sankara gives the following explanation – “Prapanchasya adhishtaanatvena bharanaat bhartaa – Bhagavan is bhartaa (Sustainer) because He sustains the Universe as its Lord. Sri Parasara Bhattar points out that He nourishes His devotees by giving Himself up to His devotees because that is His Nature – yasmaat pushnaati aatma-daanaat. The most powerful demonstrating in all His actions. Sri Parasara Bhattar says He is Prabhuh – most powerful – because he can bestow fruits such as the enjoyment of the pleasures associated with those of Brahma and even Moksha. One who has the ability to do anything without the help of any other beings or things. The first meaning is derived from the word Aishvarya – nirupaadhikam aishvaryam asya iti Eeshvarah – He is Eeshvara because He has unlimited might or power. The second meaning derives from Ishte iti Eeshvarah – One who can do whatever He wills without the help of anything or anyone. He is Sarvah as He is the Ultimate cause for the Universe. He is Sharvah and subsumes everything within Him at the time of Deluge. He is Pure and untainted, hence Shivah; and Sthanuh as He is changeless. He is the source of all Causes, so He is Bhootadhir; and he is eternal as Nidhiravyayah. He manifests again and again for re-establishing Dharma, hence Sambhavah. He gives the fruits of action as phaladaata and hence he is Bhaavanah. He supports the Universe, so He is Bhartaa. His Avatars are acts of greatness and are Prabhavah. He is most powerful, one who can do whatever He wills without the help of anything or anyone and hence He is Prabhuh. He is Supreme Eeshvarah. I feel and would like to suggest that the slokas along with the padas be given in devanagari(Sanskrit)script also. People non conversant with the Vishnusasranamam slokas may read the padas in English erroneously. Good suggestion Sir. Will surely add the Sholoka text in Sanskrit. I read with equal interest Naradar’s skills in causing discomfiture to Sathyabhama with such ease – and Krishna ‘s way of pleasing both Rukmani and S.